See the winners of the 2018 contest. 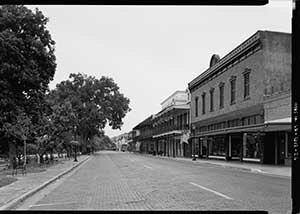 For the 10th annual HALS Challenge, we invite you to document historic streetscapes. Many cities have come to appreciate the cultural and commercial value of their historic streets. Disneyland and Walt Disney World have welcomed arriving visitors with an idealized nostalgic representation of Main Street U.S.A. since their inception. Main Street Programs across the nation have encouraged the revitalization of commercial historic districts, and now the Complete Streets movement is sweeping the design world. What makes your favorite historic street(s) unique? Does your local Historic Preservation Commission protect the streetscape characteristics and features of historic districts along with the contributing buildings? You may increase historic landscape awareness with your local governments and preservation commissions by documenting historic streetscapes for HALS and illuminating these significant pieces of America's circulatory system. Please choose an individual street or a contiguous network or grid of streets to document and pay particular attention to the landscape features: benches, bollards, bus stops, circles, context, crosswalks, curbing, drainage, facades, fencing, festivals, fountains, gutters, islands, lampposts, medians, meters, monuments, paving, pedestrian malls, parades, parking, planters, plazas, porches, public art, ramps, setbacks, sidewalks, signage, significance, squares, steps, stoops, street trees, traffic lights, trolley tracks, utilities, etc. People from every state are hereby challenged to complete at least one HALS short format history to document historic thoroughfares. Preservation through Documentation!